Our classmate Roy Henry has taken the initiative to raise funds for a Class of 1961 scholarship for a DHS pupil, with leadership qualities to the prime criterion for the award. Roy's letter to classmates and document package is below. Sorry about the small type, but we can't fit the material otherwise. But please see in particular the form to make donations! 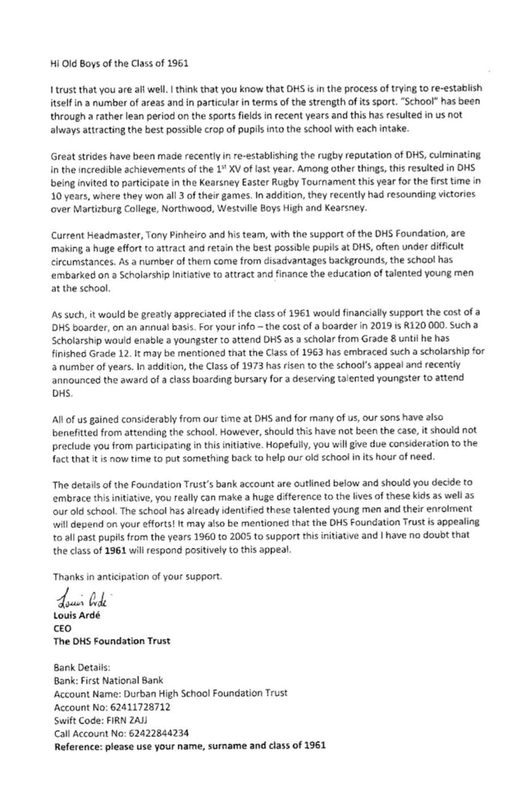 I feel we need to follow-up our fantastic Morocco reunion with the creation of a Scholarship to our Alma Mater in order that other worthy South African boys can enjoy the virtues of a great School. A few months back, I expressed the idea of creating a Scholarship after Ian Robertson, as he is someone whose history and actions I believe, reflect a message of justice required locally and worldwide today. Ian’s life apart from his stand against apartheid has also been directly linked to education worldwide. 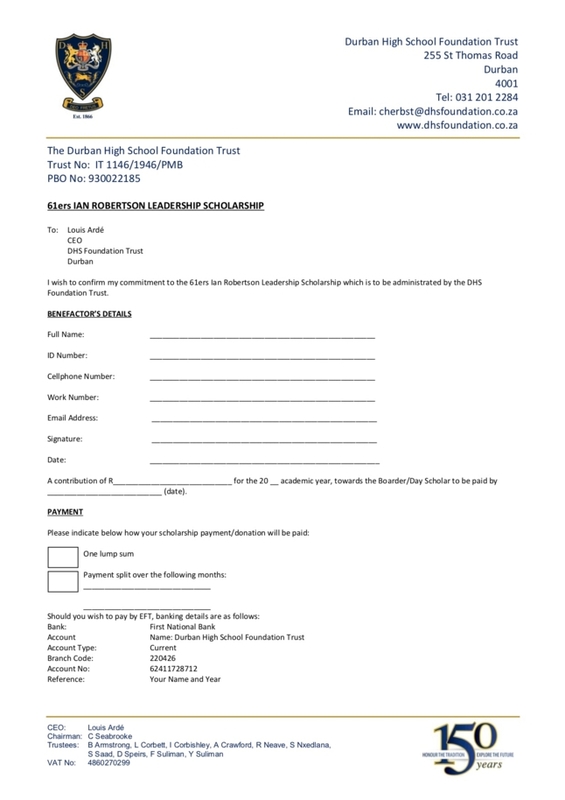 We need to reach a target of ±R1.5m by mid December 2018, to ensure that the annual interest sustains the scholarship over time. This capital approach offers greater sustainability, but requires larger once off contributions. 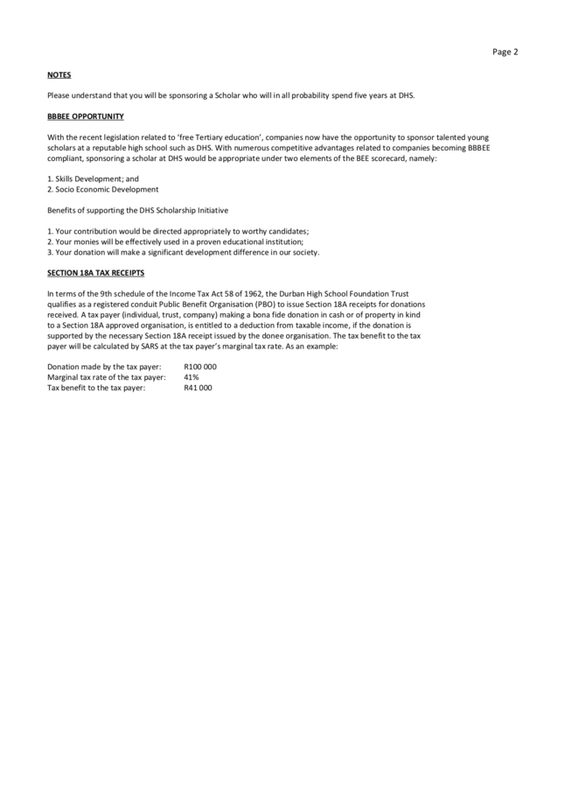 However, for those who would prefer to make monthly contributions, this is easily handled via the enclosed DHS Foundation Trust form. Once we have assessed the responses by 14 December 2018 a final plan will be agreed with Ian Robertson and Louis Ardé. c. Form for supporting the DHS Foundation Trust’s Scholarship Fund. 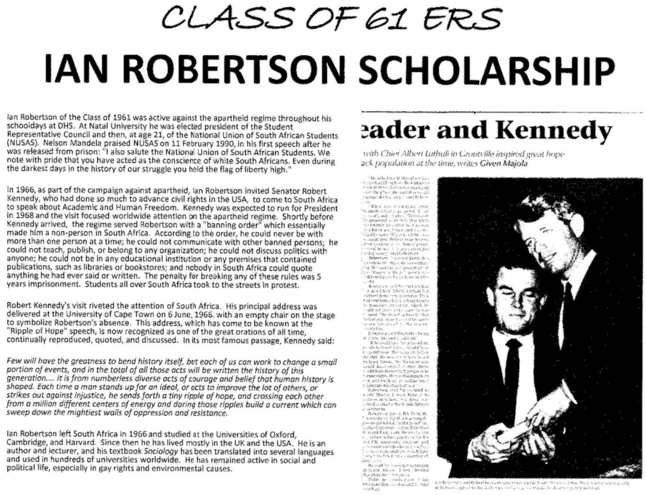 Louis Ardé of the DHS Foundation is doing an outstanding job and needs your contributions to the Class of 1961 Ian Robertson Leadership Scholarship to continue his good work. This scholarship will leave a legacy of the lucky “61ers”.